Last week I ran into a friend and fashion expert at a fashion event where we somehow started discussing espadrilles and how apt or not they are for the city. Growing up in Spain, espadrilles have always been a normal part of my summer wardrobe. At some point I might have had up to 12 different colours, which I matched with my t-shirt and wore with ripped jeans – something I will unfortunately never forget... When I was older I decided that canvas wasn't good enough anymore and that I needed more sophisticated options. That's when I bought my first pair of croc slip-ons and suede lace-ups. They weren't just super cool but the soles were properly constructed for walking in the city. This week I was so happy to find these two models from Salvatore Ferragamo (which happen to be on sale!). I wasn't lucky enough to wear Ferragamo ones when I was younger but these models reminded me so much of my own. 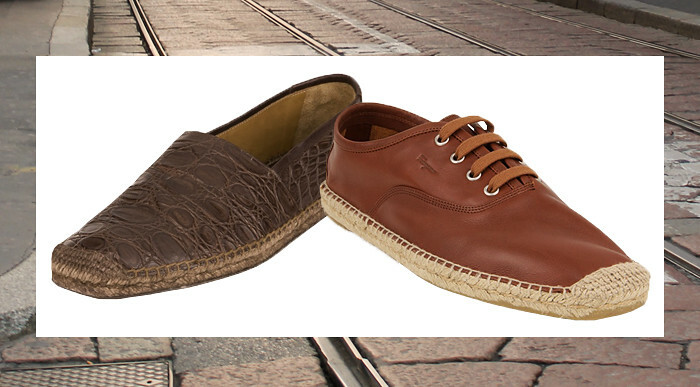 I see the classic croc espadrilles as more of a chic casual choice worn with navy shorts and a white shirt. They are also great with blue jeans, especially if you've got a tan! The Oxford espadrilles are a brilliant choice for a smart but summery vibe on any look you would finish off with desert boots or leather sneakers any other time of the year.